Jerome Roberts and his daughter Diana battled nearly unbelievable odds to become U.S. citizens. And one of the first things they wanted to do after becoming naturalized was to cast votes in North Carolina's 2014 elections. In the 1990s, they had fled their native Liberia during the West African country's deadly civil wars, which claimed the lives of both of Jerome's parents. 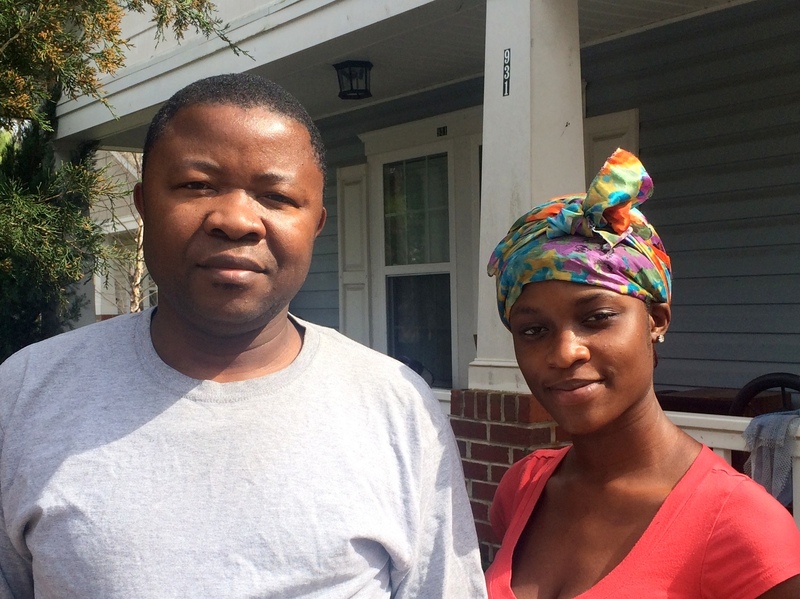 After living in a U.N. refugee camp in Ghana for several years, the family was moved in 2000 by the U.S. government to a resettlement in Charlotte, where Jerome has worked as a service technician for the city for eight years. Finally, after navigating the complicated U.S. immigration system, last year Jerome and Diana were both naturalized — and made sure they were registered to vote in North Carolina. "We had been waiting for this," Jerome told Facing South. "It was our first time in this country getting to vote. We were trying to be part of the American dream." But what Jerome and Diana encountered at the polls on Election Day was at sharp odds with their hopeful visions of U.S. democracy. On the morning of the elections, Jerome picked Diana up from high school, where she was an 18-year-old in her last semester, and they headed to their precinct at Druid Hills Academy. When they arrived, however, they discovered that Diana — despite being a naturalized citizen, and a registered voter since September — had been flagged as a potential non-citizen by state election officials. According to state law, only naturalized citizens can vote. Diana was apparently on a list of 1,454 names the N.C. State Board of Elections gave to local election officials shortly before the 2014 elections, identifying registered voters whose "citizenship status was in question." More than 300 names had been sent to Mecklenburg County. According to Jerome and Diana, their voting experience went downhill from there. A poll worker told them to wait while precinct officials "called downtown" to address Diana's citizenship status. They waited more than two hours, to no avail. In the meantime, Jerome — unfamiliar with the voting process — asked the same poll worker for help understanding his ballot; according to Jerome, she became impatient and dismissive, saying, "We can't help you." While cautious about saying so, Jerome wondered if his family's race and immigrant background were factors in how they were treated by the poll worker, a white woman. "It was a very bad experience," Jerome remembered. "It made me think she didn't like us, because of who we are." While Jerome ended up voting on Election Day, Diana — tired and frustrated — left without casting a ballot. When I asked later if she planned to try again in the next election, Diana said, simply, "No." To which Jerome added, "Is this how people vote in this country? Because these are the things that make people not want to vote." Diana Roberts' troubled attempt to vote came amidst a controversial push by Republican lawmakers and conservative activists to clamp down on an alleged epidemic of non-citizen voting — a push that has coincided with changing demographics in North Carolina and other states. In 2014, one such group in North Carolina — the Raleigh-based Voter Integrity Project, headed by Jay DeLancy — declared that "tens of thousands" of non-citizens were registered to vote in the state. The Project, along with the group NC FIRE — an organization aimed at "stopping the flood of illegal aliens into North Carolina — and others, had been making such claims for years, even after they were repeatedly debunked. But weeks before the November 2014 elections, two political scientists at Old Dominion University revived the debate with a guest column in The Washington Post, claiming that up to 6 percent of non-citizens in the U.S. voted in 2008, nearly 18,000 in North Carolina alone. Despite being widely criticized by election experts for using unreliable self-reported survey answers and having an extremely small sample size, the story generated national buzz in right-wing media outlets and was seized on by activists like DeLancy, who contacted state officials about the alleged "non-US citizen fire storm" [pdf]. North Carolina election officials have had procedures for removing ineligible voters from the rolls, including non-citizens, for many years. However, efforts to target suspected non-citizens were stepped up in 2013, after Republican lawmakers installed new leadership at the N.C. State Board of Elections. In the fall of that year, the state board signed an agreement with the U.S. Department of Homeland Security and U.S. Citizenship and Immigration Services to verify voters' citizenship status, using the federal Systematic Alien Verification for Entitlements (SAVE) database. Drawing on SAVE data, the N.C. elections board launched a "Citizenship Audit" in 2014 that identified 10,000 registered voters in need of "review." Distancing themselves from the larger numbers floated by DeLancy and others, N.C. election officials announced they had identified only 1,454 individuals in 81 counties with possible citizenship status problems. Despite the time and expense poured into the Citizenship Audit program, it ended up identifying few cases of potential non-citizen voting. According to a report on the Citizenship Audit [pdf] prepared by the N.C. State Board of Elections in February of this year, out of the 1,454 names flagged by the state election board, 1,365, or 94 percent, didn't attempt to vote. Of the 89 who did come to a voting site, 64 were challenged by election officials or stopped for further questioning. In nearly two-thirds of the cases, the voter was able to prove s/he was indeed a citizen (30 voters), or the challenge was otherwise dropped (13). Challenges to alleged non-citizens were sustained in only 11 cases, or .0004 percent of the 2.9 million ballots cast in 2014, and .0002 percent of North Carolina's 6.6 million registered voters. The problems with the N.C. election board's Citizenship Audit appear to have been exacerbated by the way it was carried out by state officials in 2014. According to the state board's own report, the list of potential non-citizens wasn't finalized until Oct. 24, 2014 — a day after early voting had already begun in North Carolina and 49 days after the start of mail-in absentee voting. After the list was drawn up, there was more delay in distributing the list to county election boards, along with a 25-page instruction manual on what to do if any of the 1,454 individuals showed up to vote. Last year, a federal court ruled that Florida violated federal election law when it purged suspected non-citizen voters within three months of the 2012 elections. Florida's purge violated the "90 Days Provision" of the Help America Vote Act, which requires states to "complete, not later than 90 days prior to the date of a primary or general election for Federal office, any program the purpose of which is to systematically remove the names of ineligible voters from the official lists of eligible voters." Because North Carolina didn't actively purge the alleged non-citizen voters in 2014, it likely didn't run afoul of the law, but the state's last-minute watch list of flagged voters proved chaotic for local elections officials. In Mecklenburg County, where Diana Roberts unsuccessfully tried to vote, the county didn't receive its list of 300-plus flagged names and the accompanying training manual until after 1 a.m. on Nov. 2 — just two days before Election Day, according to the election board's public information officer, Kristin Mavromatis. She said county staff spent 12 hours that Sunday scrambling to print out lists, verify information and advise local precincts about how to respond. It's impossible to tell from the state data if other voters were improperly blocked from voting like Diana Roberts. The state's Citizenship Audit report notes that 10 people on the list "left without voting" after being formally or informally challenged, but that figure — based on what counties reported back to the N.C. State Board of Elections — may understate how many were turned away. For example, figures given to Facing South detailing Meckenburg County's report to state officials states that "0" people left without voting after facing a challenge or "unofficial inquiry," despite Diana Roberts' experience to the contrary. Facing South made several attempts to get comment from the N.C. State Board of Elections, but officials there did not respond. According to voting rights advocates, Diana Roberts' story underscores how the crusade to stop non-citizen voting can end up causing more damage to the integrity of elections than the fraud it claims to eliminate. They also say it opens the door to a form of election racial profiling and a climate of harassment at the polls that can intimidate and ultimately disenfranchise voters. "It's a modern-day witch-hunt," Bob Hall of the election watchdog group Democracy North Carolina told Facing South. "When legitimate voters are stopped from voting, that's a form of voting fraud." Most election experts seem to agree that voting records in North Carolina and other states do contain errors, including the names of non-citizens. But it's a "relatively small" issue compared to the myriad other problems plaguing state and federal elections, according to Prof. Rick Hasen at the University of California-Irvine School of Law who runs Election Law Blog. What's more, Hasen has argued that these and other problems with registration and voting could be addressed with a federal overhaul of the election system, such as "a national voter identification program run by the federal government which paid for all the costs associated with establishing identity and citizenship." But due to state resistance to federal intrusion in elections — especially among conservative lawmakers — Hasen added, "I don't expect we will see this program in my lifetime." Jerome Roberts in Charlotte, however, wants to believe that if enough people learn about the problems his daughter and other voters have experienced in the wake of the crackdown on alleged non-citizens, it may spur lawmakers to take action. "If people hear about this," he told Facing South, "maybe they will fix it." Additional research and reporting provided by Alex Kotch.